Spinning for a project this size gives the spinner plenty of time to think. As I was spinning this fiber, the colors were bringing back memories of the home I lived in when I was a small child. Large lilac trees to hide in, trellises and stone walls with wild berries climbing all over them. Lots of beautiful smells and flavors, and lots of small repeating textures. 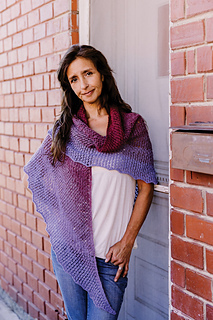 This large triangular shawl plays with the subtle changes in texture and density between two stitch patterns. 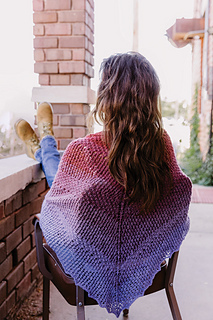 It highlights the gradient color change in the fiber and celebrates (or conceals, if you prefer), any variations in thickness in your handspun. 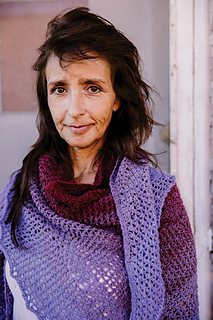 It is an easy introduction to lace knitting for beginners, and the short rhythmic pattern repeats are soothing for experienced lace knitters. It is worked from the center out and uses a garter tab cast on. Finished measurements: 89 inches/226 cm wingspan, 35 inches/90 cm deep at center back.